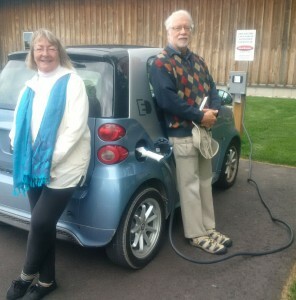 Bob and Darlene James of Dundas, Ontario not only enjoyed their visit to the Stratford Perth Museum this morning — but they were able to charge up their electric smart car at the same time. 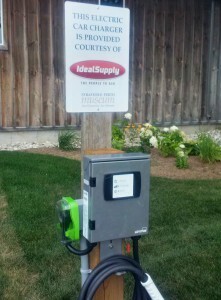 Thanks to Ideal Supply the Museum now has an electric car charging station. What’s new at the Stratford Perth Museum? How about an electric car charger! Thanks to an initiative, as well as a generous donation from Listowel-based company Ideal Supply, motorists with electric cars are now able to charge their vehicles at the Stratford Perth Museum. The charger is free to use. “Rural areas in general – and that area of Perth county in particular – is underserviced for access to Electric Vehicle Charging Stations,” said Tim MacDonald, president and CEO of Ideal Supply. “Installing one at the Stratford Perth Museum seemed like a great way to draw attention and traffic to this incredible facility – while supporting local owners of electric vehicles and visitors to the Museum. By collaborating with Leviton and Culliton we were able to make it happen.” Leviton is the maker of the electric car charger and Culliton did the installation. The Museum is happy to be joining the electric car-charging network. “From the Museum’s perspective it is very much in keeping with our environmentally aware approach,” said John Kastner, general manager at the Stratford Perth Museum. The Museum is located just west of Stratford at 4275 Huron Road (Highway 8, Line 34). The parking spot closest to the road is outfitted with the electric car charger.